Hampi has some mind blowing-ly large sized monolith sculptures!!! Here are the main ones! Lakshmi Narasimha (Yoga Narasimha): The most prominent sculpture of Hampi is the huge seated Narasimha in Lakshmi Narasimha Temple. Narasimha is the lion faced incarnation of Lord Vishnu. This is currently a Yoga Narasimha meaning, the Lord has a band called Yoga Pattam between his knees making it a yogic pose! However originally it was a Lakshmi Narasimha meaning, he has his consort Lakshmi seated on His left lap all in a single piece of granite! Today just one of Her arms is visible, around his waist! After His knees, half of his thighs, forearms and ofcourse, Lakshmi etc were destroyed in the Islamic invasion, it was restored sometime after 1984. Additions were done at its knees to ankles and to support the structure, a wedge was placed below the thighs and the Yoga Pattam was also introduced as a reinforcement! The below image is from the ASI Archive of how it was before restoration! This is 6.7m tall. The Lakshmi Narasimha has a Makara Thorana (an ornate arch) around, with a seven hooded snake - all carved out of one boulder!!! This was made during the era of Krishna Deva Raya in 1528 by a Brahmana. Siva Linga: Just beside the Lakshmi Narasimha temple is the Badavalinga Temple. 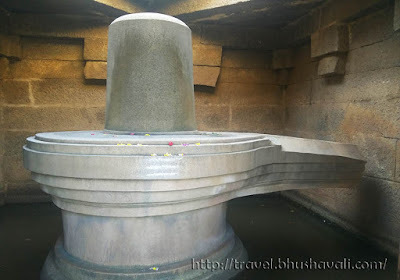 This has an enormous 3m tall Siva Linga whose base is submerged in water. This temple is still in worship. There is a slight superficial carving of the 3 eyes of Lord Shiva. Sasivekalu Ganesha: About half a km from these 2 places, is Sasivekalu Ganesha, safely sitting in a 16 pillared mandapa, in the slope of Hemakuta Hill! Sasivekalu in Kannada means Mustard Seeds and I dunno why was he names so. May be, ages ago, this was surrounded by mustard plantations?! This is 2.4m tall. Close to this is Kadalekalu Ganesha. Kadalekalu means grams! 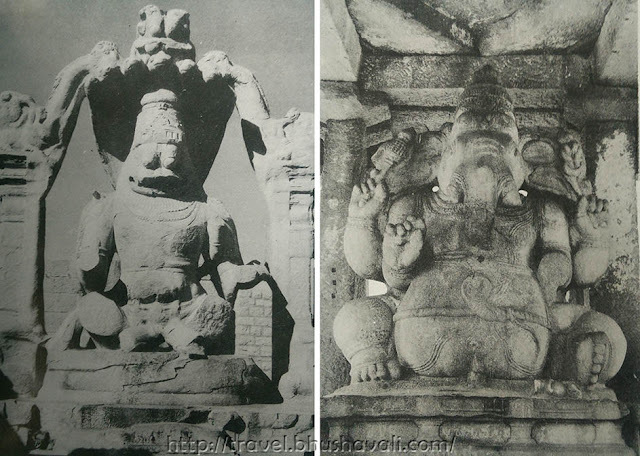 Similar to the Lakshmi Narasimha, this too was vandalized and its trunk and lower left hand were broken which were later sorted during restoration probably around the same time as Lakshmi Narasimha! Like most common depiction, he's holding one of his broken tusk in his lower right arm (he wrote the Mahabaratha with this!). Nandi (bull): Bang opposite to the Virupaksha Temple, at the other end of the Hampi Bazaar is the huge Nandi. This has a ceiling supported by a 2 storied pavilion. Just beside this is the hillock, trekking which, leads to the Achyuta Raya Temple. P.S: Check out here to know what I wore for this trip. These sites are covered in The Virupaksha Trail & Tungabadhra Trek organized as a guided tour by Orange County Resort. Love this - and that Hampi sculpture is my fave with his big eyes and yoga pose! I have never traveled this part of the world - so I always love reading your articles about these amazing places! They're very wonderful statues rich with history. Your post makes me want to read story or books about Lakshmi and other characters you've mentioned. So in the near future if I visited them, I'll be already knowledgeable about what I'm looking at. Monolith statues and sculptures have always fascinated me a lot. Makes you wonder about the techniques, craftsmanship and skill levels of those days. I think despite all the technology at our disposal today, we can never match up. Hampi has long been on list. Karnataka is treasure trove of some of the amazing historical monuments and sites. Those huge statues epitomize the architectural beauty of bygone era. It's a little difficult to discern that these are sites in India until the end of the post. For someone who isn't that familiar with India, I'd suggest adding that much earlier in the article. Otherwise, very interesting and informative post! What a beautiful place. I love discovering such ancient ruins. And this is very informative since you've mentioned all the essential details. Now I'm very curious why the Lord Ganesha is named Mustard Seeds. There is so much detail in the large statue of Narasimha. Kadalekalu Ganesha statue looks impressive too, the restoration process must have taken a long time. Again you've made some amazing photos from Hampi, you are the go to person for Hampi! These sculptures are incredible although I wonder how long will they last. They do not look very stable. A thorough renovation is needed for these sculptures. I have lost the count of the number of times I have been to Hampi, but can never get satiated enough with Hampi. It's wonderful to read about a place close to me! I always look at Hampi as one of the best destinations in India and also a photographer's delight. The ancient ruins are truly a sight and overall its just a peaceful place. Monoliths are usually very interesting structures to see because of their huge size and intricate carvings. They give a sense of power, very awe-inspiring and impressive to behold because of their huge size. Your Hampi tales are beyond fabulous. Each post just leaves me wanting more. Love monoliths! They are truly architectural marvels! :) Great pictures! It would be impressive seeing these structures. They seem huge and really look to share a lot of significance and story. Hampi has been on my bucketlist for the longest time...and I yet have to get there! Will surely get here in October and couple the trip with Dusshera in October. The monoliths look so grand...how advanced was art and architecture ages ago...I am amazed! Always enjoy exploring these temples and ruins! They are like walking down the path of history, just imagining the time when they were made. There are many monolith sculptures around the world but this one in Hampi is truly a unique feature! I love seeing ancient architecture especially from different countries. It gives you a glimpse of how it was like before but not really knowing what happened. I think it would be nice to see these in person. hi, love the way you have given details about sculptures and how you can reach to destination from different places. It made me travel back in time. I like visiting historical places too and learning about its story. It's nice that everything is close to each other so you get to visit all of them. The Sasivekalu Ganesha looked so grand. Indian sculptures are quite fascinating and there is always a beautiful story related to it! That Lakshmi Narasimha sculpture looks massive and surreal! This is a great architectural marvel from India. It makes for a great road trip from India. It is called Sasivakalu and Kadelekalu owing to the color of the stone that makes the Ganesha. :-) I discovered that through our guide on my trip. Also, did you know the story behind the snake on Sasivekalu Ganesha's belly? :-) It is quite a funny and interesting one! I find the structures similar to Indian statues? Am I right? Awesome! That Narsimha looks almost real. Salute to the creativity of those artists. I remember visiting some places where the same type of sculptures of Nandi, Ganesha and Narsimha are situated. I guess somewhere near Hyderabad. Hampi is a real wonderland in stone. A silent testimony to the artistic capabilities of the people who walked on this land years ago. The beauty of the stone structures draws me to Hampi, again and again and everytime I am awestruck. I never knew about Hampi until I was in India and people kept raving about! Wish there was time, especially for these cultural relics! Great article. Really informative. The sculptures look really interesting. We're currently in India now and this has become something we might consider visiting. Thanks for sharing. I see that you visit a lot of temples, and I wonder out of all the temples you've visited, is there any one that's particularly memorable or any temple you connect particularly well with? I was awe struck the first time I visited Hampi. The place has an old world charm like no other. I felt like I was walking in a time warped megacity. I would love to visit Hampi again and do it at a slower pace this time.